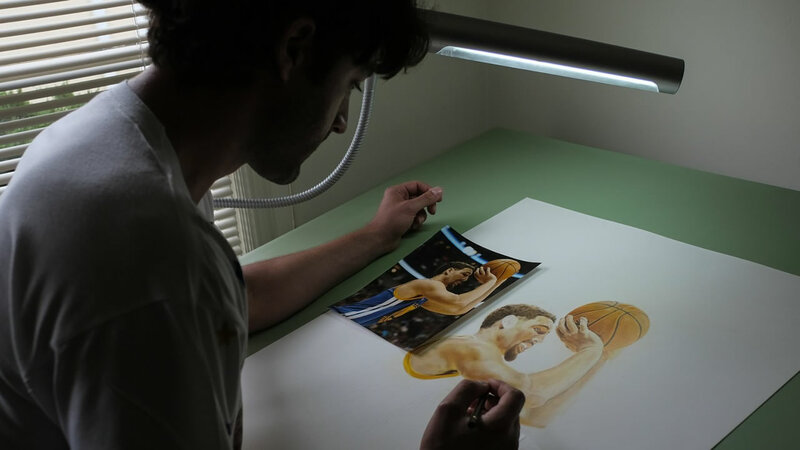 BERKELEY, Calif. (KGO) -- An East Bay artist who's also a huge Warriors fan is following his passion. Yani Teichner lives at his mother's house, where he's transformed a bedroom into a studio. He's spent hours creating wearable, limited edition, non-fading, signed prints of the Warriors starters. Teichner drives for Uber and uses every square inch of the car for advertising space. He believes in serendipity. Klay Thompson recently climbed in the back of his car as Uber customer, where he saw Teichner's shirts. Click here for the full story from ABC7 News' Wayne Freedman, to learn more about the chance encounter between the Warriors star and one of the team's biggest fans. And take a look at his photo essay below. Click here to follow Wayne Freedman on Twitter for more photo stories. Click here to purchase one of Yani's t-shirts. Click here for more stories, photos, and videos on the Golden State Warriors.